*NOTE: Online Manual is available. Extra thick chisel head for a life time of resharpening. 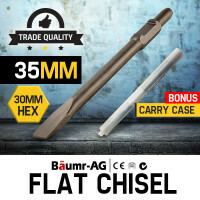 Suits all 30mm hex Baumr-AG, Hitachi PH65 PH65SA H65SB2 H70SA, Makita HM1303 HM1317C HM1307C HM1304 HR1400 HR1317C, ROK 150-36-551, TWM, Millers Falls PT4370, Z1G-DW-45 and more! 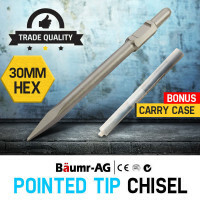 Suits All 30mm Hex Bäumr-AG, Hitachi PH65 PH65SA H65SB2 H70SA, Makita HM1303 HM1317C HM1307C HM1304 HR1400 HR1317C, ROK 150-36-551, TWM, Millers Falls PT4370, Z1G-DW-45 and more! Extra Long Chisel Head for a Life Time Of Resharpening. 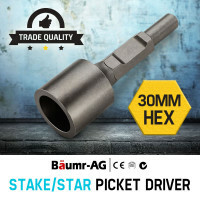 Suits All 30mm Hex Bäumr-AG, Hitachi PH65 PH65SA H65SB2 H70SA, Makita HM1303 HM1317C HM1307C HM1304 HR1400 HR1317C, ROK 150-36-551, TWM, Millers Falls PT4370, Z1G-DW-45, BMJK-24S and more! 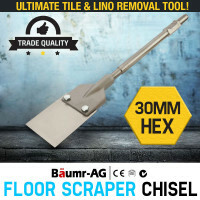 Breaking up concrete, pavement and rock can be a very daunting task but having the right tools can make things much easier. At Edisons, we offer a fine selection of heavy-duty Baumr-AG Jackhammers that are built with high-quality and precision components to get the job done in no time. 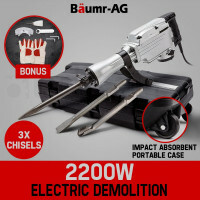 Available in petrol and electric versions, Baumr-AG Jackhammers are powered by huge torque commercial motors with maximum power intended for all kinds of demolition works. These fantastic machines can easily break through solid rock, tear up foundations, and demolish reinforced concrete walls and floors. 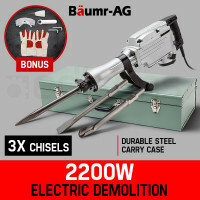 Packed with many impressive features, these jackhammers are the perfect companions at construction sites and even when renovating bathrooms, kitchens or any other parts of the house. Combining the highest spec motor and mechanical components with high tensile reduction gear set, Baumr-AG Jackhammers can deliver greater impact transfer with very little loss. The balanced precision stator assembly is designed for maximum efficiency. The high-quality rubber handle comes with an Anti-Vibe technology for superior control and comfort. 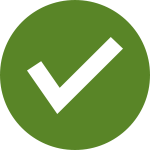 These products are also known for their superior cooling for prolonged use. 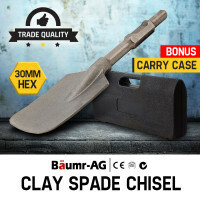 Baumr-AG Jackhammers have many other impressive features including the oil level sight glass, the adjustable handle for optimal ergonomics, and the rugged forged impact-resistant body. The popular Series II Vibe-Flex rubber hand grip is designed to decrease vibrations of up to 40% while the thumb throttle control simplifies regulation beats per minute. 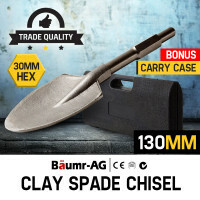 When you buy a Baumr-AG jackhammer, you will receive different bonus accessories such as the safety gear and tools, solid durable iron hexagonal chisels and a tough case that can withstand even the toughest impact. To complement these jackhammers, Edisons also offers a wide selection of fine quality chisels. To ensure total customer satisfaction, you also get a full 12 months warranty each time you buy a jackhammer. Aside from Jackhammers, Edisons also offers a wide array of construction tools like Saws, Nail Guns, Laser Levels, Vacuums, Drills Bits, and many more. 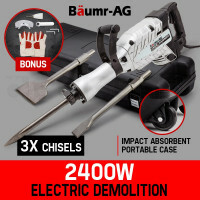 Order a Baumr-AG Jackhammer today and experience the benefits of using a truly fantastic machine!